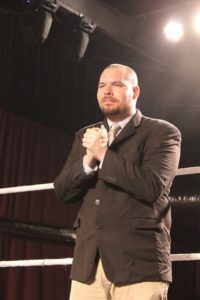 Christopher White grew up in Dyersburg, TN with aspirations of one day being involved in pro wrestling but every time he voiced these aspirations someone would undoubtedly bring up one name… “The Golden Boy” Greg Antony. The more this occurred the more enraged Christopher became and one day his rich uncle from New York City told Christopher that he would help him achieve his wrestling dream but all he had to do was rid the sport of Greg Anthony. Like a man possessed, Christopher White has brought in many a man to destroy Greg Anthony but has yet to be successful.